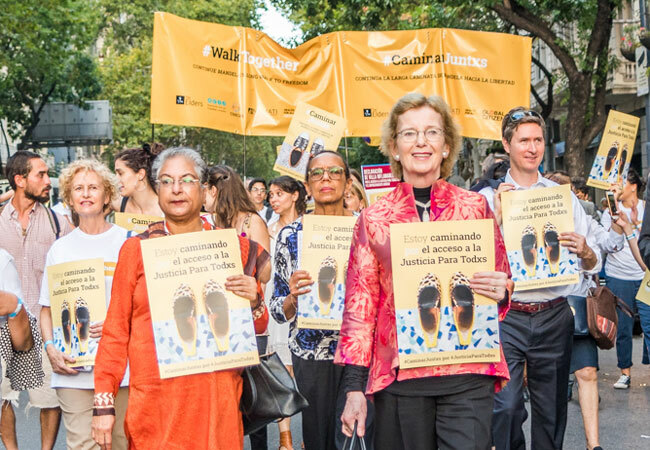 Since last July, the Walk Together campaign has celebrated both the tenth anniversary of The Elders and the centenary of our founder Nelson Mandela’s birth by championing the freedoms he cherished and which inform our work. Recently we launched a new ‘quarter’ of our campaign activities, focusing on the scourge of economic inequality and the need for systemic change to achieve a more equitable world. Widening inequality both within countries and between them has led to a vast concentration of wealth and power in the hands of the few, whilst hundreds of millions struggle to survive. Without radical change, by 2030, the richest 1% will own two-thirds of global wealth while almost half a billion people will still live on less than $2 a day. Tackling what campaigners refer to as an “epidemic of inequality” will take collective efforts to achieve a range of policy outcomes. There is no single quick fix to the pervasive challenge of inequality. Policy decisions at national, regional and international levels will vary, covering issues as diverse as access to justice, healthcare, land rights, gender and minority rights, trade policy and tax reform. As with our previous work on peace, health and justice, Walk Together is working to fight inequality by shining a light on courageous “Sparks of Hope” - grassroots organisations working to end inequality in their countries and communities. 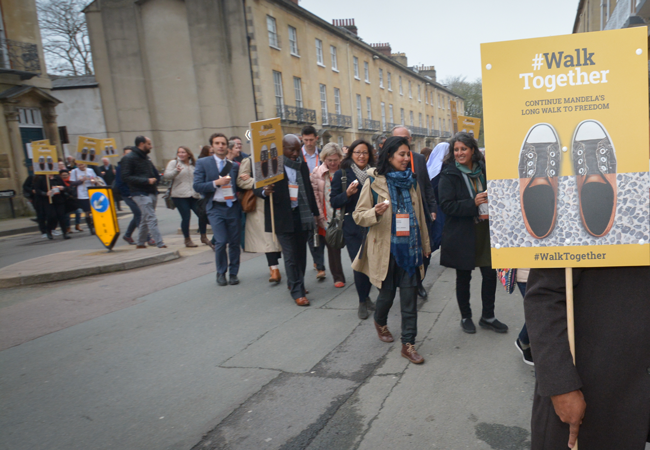 Our inequality campaign kicked off on 11 April in Oxford symbolic walk following the culmination of the Skoll World Forum. 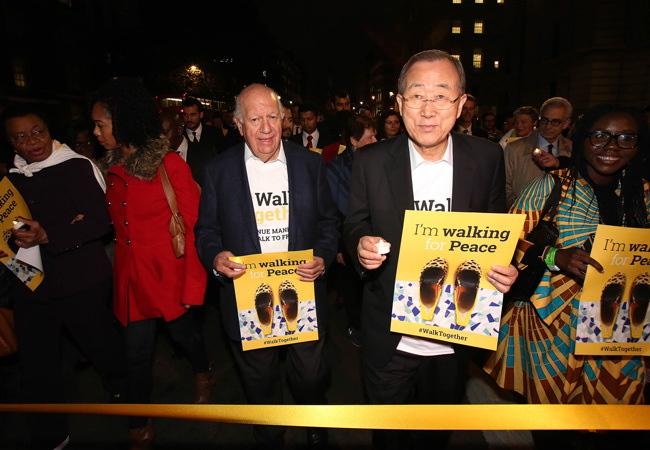 Lakhdar Brahimi led the walk alongside Forum attendees and representatives of various Sparks of Hope. The following week, #WalkTogether hosted a panel event at the London School of Economics (LSE) on 17 April during the Elders’ board meeting in London. 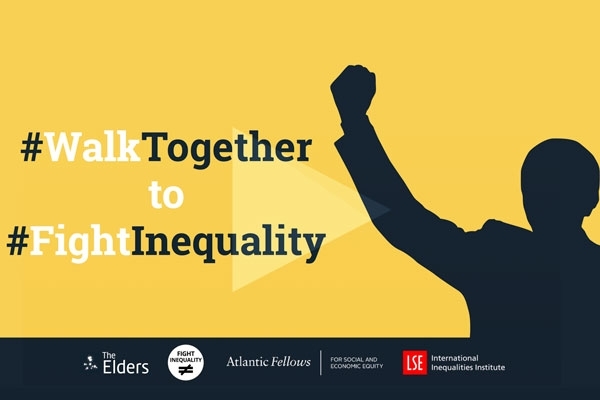 Working with the Fight Inequality Alliance and Atlantic Fellows for Social and Economic Equity, we convened academics and grassroots activists to debate with Elders on how best to tackle inequality and deliver sustainable systemic change. Gro Harlem Brundtland, Mary Robinson, Ban Ki-moon, Ernesto Zedillo and Graça Machel joined young leaders and activists from around the world for an invigorating discussion on economic imbalances, gender discrimination and the rise of the #MeToo movement, youth disempowerment and the need for engagement with political systems rather than a wholesale rejection of their worth. Closing the event, Graça Machel called on young people to think strategically to make effective change towards combatting inequality in their societies. The event was livestreamed to a global audience of around 65,000 people, with many more engaging with its messages via social media. #WalkTogether to #FightInequality reached over 14 million people on social media on the night, inspiring over 3,000 online conversations. This resulted in #WalkTogether being the number two trend on Twitter in London over the course of the evening. But the #WalkTogether to #FightInequality has only just begun. With less than 100 days until the centenary of Mandela’s birth, we will be shining a light on the inequalities facing the world today and the Sparks of Hope who are working to overcome them. Join the #WalkTogether to #FightInequality: share a picture from our toolkit or create your own.